The purpose of this paper is twofold. First, we explore empirically to what extent the determinants of trade in services differ from those of trade in goods. Second, by the use of instrumental variables, we explore potential complementarities between bilateral trade in goods and bilateral trade in services. Using a gravity framework, the main results show that bilateral trust and contract enforcement environment, networks, labour market regulations and variables denoting technology of communication have a higher impact on services trade than on goods trade. Finally, after using instrumental variables, we find that bilateral trade in goods explains bilateral trade in services: the resulting estimated elasticity is close to 1. 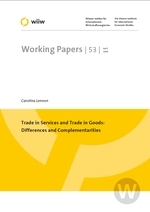 Reciprocally, bilateral trade in services also affects bilateral trade in goods, though to a lesser extent: we find an estimated (positive) elasticity of 0.46.